The concept of "Chef To Go" is about having your own personal chef cook for you at home. It is also the first cooking show ever to be seen on primetime television. Flambé is a cooking procedure in which alcohol is added to a hot pan to create a burst of flames. The word means flamed in French (thus, in French, flambé is a past participle; the verb is flamber). 1. Cook this when the risotto is almost finished. 2. Split the prawns in half and season the prawns with salt and pepper. 3. Heat the oil in a very hot pan and sear flesh side down until browned but still raw, quickly invert the prawns to skins side down and carefully flambé with the brandy and finish with the butter…cook until prawns are just done and do not overcook. 4. Sweat the onions and garlic in the oil then add the rice and coat fully with the oil. 5. Slowly incorporate the liquid a ladle at a time and allow the rice to absorb it before you put the next ladle. Repeat the process until the rice is cooked yet firm to the bite. 6. When the rice is done add in the cheese and season finally with salt and pepper. 7.To finish the plate. 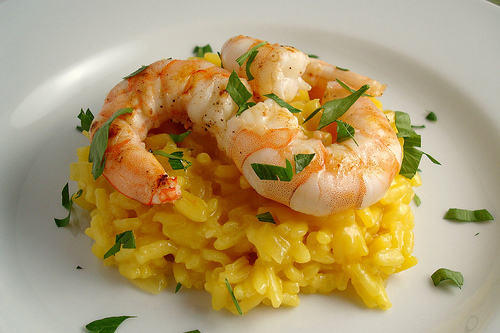 Plate the risotto with the prawns over it. Drizzle with reserved sauce around and garnish with parsley.